Lafayette model DT92 tube audio amp for phono radio or xtal etc. Unit has been recapped and tubes have been tested good. Tubes 2ea # 35C5, 1 ea 12AX7, and 35W4. Nice original 3 knobs. Power cord in good condition. Orange Amplifiers Micro Terror 20W Tube Hybrid Mini Guitar Amp. Condition is Used. Shipped with USPS Parcel Select Ground. Trending at $118.00eBay determines this price through a machine learned model of the product's sale prices within the last 90 days. 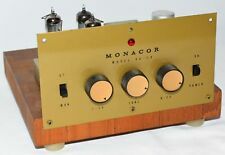 This Mini Monaco tube amp is fully working. Both channels work. The input works. Tubes work. ON/OFF light works. I can also send you a separate invoice. Up for sale. Longest running authorized Biyang United States Dealer ! The Mini 5 is Wangs’ 5-watt all tube head. It runs on a 12BH7, a pair of 12AX7 tubes and a 6Z4 rectifier. There’s also a pair of toggle switches. 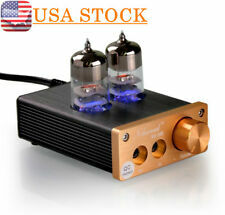 1pc APPJ EL84 12AX7B MINI Tube Integrated Amp New. Tube: Shuguang EL84 2pcs, 12AX7B 1pc. Input Sensitivity: 500mV. Input Impedance: 50K ohms. Input: RCA Jacks. Power Consumption: 38W. It is not including power cord. The Mini 5 is Wangs’ 5-watt all tube head. It runs on a 12BH7, a pair of 12AX7 tubes and a 6Z4 rectifier. There’s also a pair of toggle switches. The second switches between Bright or Warm. Around back is a power switch, an IEC socket to plug in the supplied power cable and a pair of ¼” speaker jacks. NORMAL-- Basic characteristic sound of Little Monster BM. 5 watts all-tube guitar amplifier head with ECC83(12AX7) & ECC81(12AT7) & 6V6GT tubes. 1 Amplifier Head. TOP BOOST-- More gain will be obtained in this channel and the high band frequency will be increased a little bit. 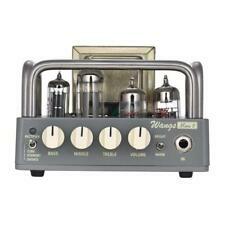 This is the Peavey Classic 20 Mini Tube Guitar Amp Head. A three position power attenuator switch allows the Classic 20 Mini Head to function at 20, 5, or 1 watt, making it ideal for recording purposes. There is a light scuff in the tweed on left side of the head but the tweed pattern makes it fairly unnoticeable. Otherwise the head is in overall excellent shape. We have fully tested the head and it is in perfect working order. The channels share EQ, lush reverb and an effects loop. Channels, crunch, effects loop and reverb are all footswitchable. T.S.I.™ tube monitoring constantly lets you know that your power tubes are in good shape, and if not, which ones need to be replaced. Well, APPJ mini2013 tube amp, what is this actually?. Another one piece of trash orient vacuum tube engineering?. The amp has both original (average junk) and high-end (U.S. made JAN 5654W and Soviet military 6P1P-EV ) NOS NIB tube sets. Dr. Z Mini Z 1x8 Combo Amp. Model: Mini Z 1x10 Combo Amp. Very clean and all original first generation Dr. Z Mini Z amp. 5 watts of rock n roll! Overall in great shape and sounds fabulous. Serial: N/A. The MV50 is equipped an all-analog pre-amp circuit that features Nutube, a revolutionary new vacuum tube that produces authentic tube tone at a fraction of the size. From warm, natural cleans to dynamic overdrives, this power amp has been engineered to respond to the nuances of your guitar and, of course, your technique. The channels share EQ, lush reverb and an effects loop. Channels, crunch, effects loop and reverb are all footswitchable. T.S.I. tube monitoring constantly lets you know that your power tubes are in good shape, and if not, which ones need to be replaced. 1 x Peavey PVi 100 XLR PV Series Dynamic Cardioid Microphone w/ Mic Clip (577800). Peavey PVi 100 XLR PV Series Dynamic Cardioid Microphone w/ Mic Clip (577800) - Empty Sub Boxes. - Motorcycle Speakers. The channels share a three-band EQ, lush reverb and an effects loop. The channels, effects loop and reverb are all footswitchable. This item has been factory refurbished by Peavey. Factory refurbished product gives you an opportunity to buy products at the lowest prices possible. These sets are 115 volts. With 5 watt power output, it is a perfect solution for bedroom jamming, studio projects and general rockin. 5 Watt all tube amp head with 2 rectifier modes(TUBE & DIODES) and 8ohm/16ohm speaker output jacks, very powerful. The MV50 has an all-analog preamp circuit that uses a 6P1 Nutube, so you can get authentic tube sound for a fraction of the size. This amp is perfectly designed for use with the BC108 cabinet in mind, but will work great with nearly anything you want to use.